Wondershare Video to BlackBerry Converter for Mac is an excellent solution to putting video on BlackBerry for Mac OS users. This Mac video to BlackBerry converter can convert video files including MPEG1, MPEG2, MP4, 3GP, 3G2, AVI, Mpeg TS/TP (for HD Video) to BlackBerry video formats. It can even extract audio from video to MP3 and AAC audio formats. Convert video and audio files to BlackBerry video and audio. ...... You can trim video length, crop video area, set video brightness, contrast, and saturation, and customize video/audio output settings. 2. Convert video to BlackBerry AVI, BlackBerry 3GP and BlackBerry MP4. 3. Extract and convert audio tracks from video or audio files to M4A and AAC. 4. Trim your video files to capture and convert your favorite video clips. 5. Crop your video area to remove the black video sides. 6. Adjust your video effects by setting video contrast, brightness and saturation. 7. Allow you to set video resolution, video frame rate, video bit rate, audio bit rate, audio sample rate and so on. 8. Let you preview your videos before converting them. this Mac BlackBerry Converter to play the video anywhere you want it! Convert Video to BlackBerry and video to blackberry curve. Eztoo Video Converter for mac can converts between all popular video formats. Rip DVD to AVI, 3GP, MP4, WMV and MP3, AAC, WMA for playback on BlackBerry. 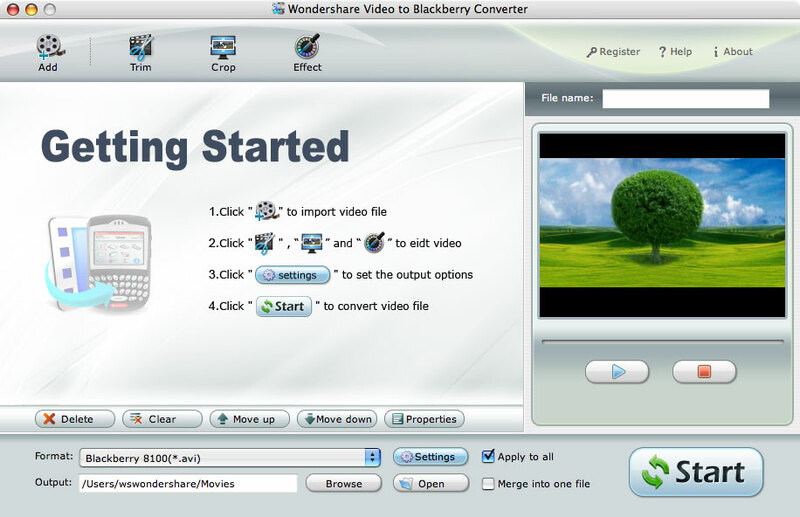 Qweas is providing links to Wondershare Video to BlackBerry Converter for Mac 1.1.25 as a courtesy, and makes no representations regarding Wondershare Video to BlackBerry Converter for Mac or any other applications or any information related thereto. Any questions, complaints or claims regarding this application Wondershare Video to BlackBerry Converter for Mac 1.1.25 must be directed to the appropriate software vendor. You may click the publisher link of Wondershare Video to BlackBerry Converter for Mac on the top of this page to get more details about the vendor.